1. Casteel, J.E., Horse Jockey, Valley Point, W. Va.
Casteel, J.E., Horse Jockey, Valley Point, W. Va. Portrait of J.E. 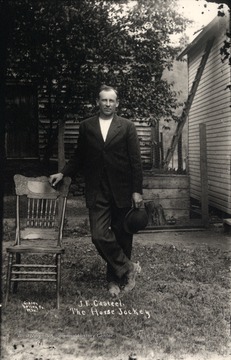 Casteel, "The Horse Jockey," Valley Pt., West Virginia. 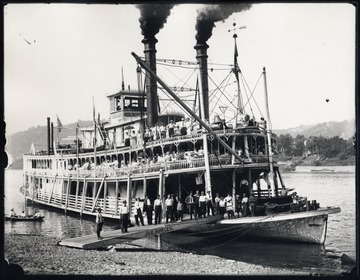 Steam packet "Joe Fowler" on the shore of the Ohio River with passengers posing for their portrait. 3. Lumber Yard in Tucker County, W. Va.
Lumber Yard in Tucker County, W. Va.
Lumber piles beside a train track. 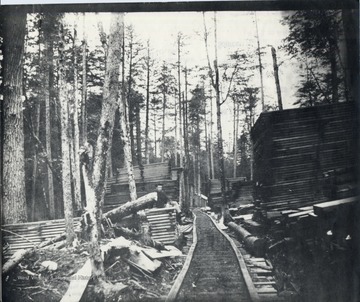 Man sitting on top of one lumber pile. 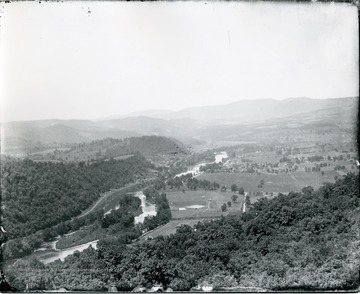 Original from Homer Floyd Fansler, Hendricks, W.Va.
4. 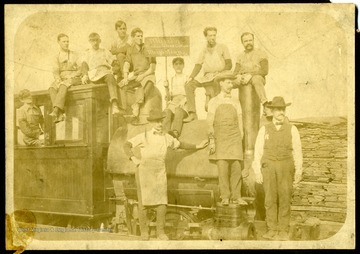 Marilla Window Glass Cutters, Morgantown, W. Va.
Marilla Window Glass Cutters, Morgantown, W. Va.
Group portrait of the Marilla Window Glass Cutters of Morgantown, W. Va. On Engine from left to right: Arthur Lewis, Hugh Fairfield, Dan McLamell, Jim Kifer, Deney Lelabey, Fred Salzman, Orcan DuBoise, Frank Dallons. Standing on Engine: Harry Davenport. Standing on platform: Arthur Swan, Bill Lewis. 5. 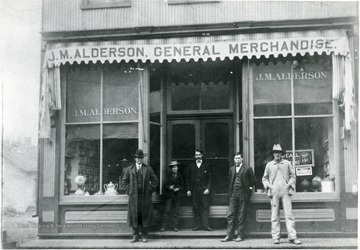 J. M. Alderson General Merchandise Store, Alderson, W. Va.
J. M. Alderson General Merchandise Store, Alderson, W. Va.
6. 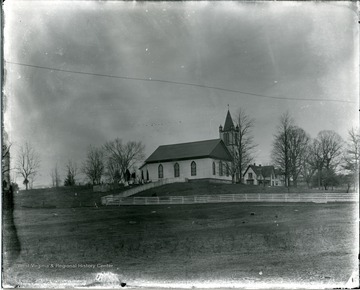 Greenbrier Baptist Church, Alderson, W. Va.
Greenbrier Baptist Church, Alderson, W. Va.
Old Greenbrieer Baptist Church with side cemetery. 7. 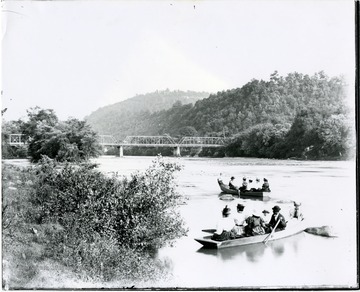 Boaters on Greenbrier River with Iron Bridge in Background, Alderson, W. Va.
Boaters on Greenbrier River with Iron Bridge in Background, Alderson, W. Va.
A birds eye view of Alderson, West Virginia. Taken from Indian View. 9. 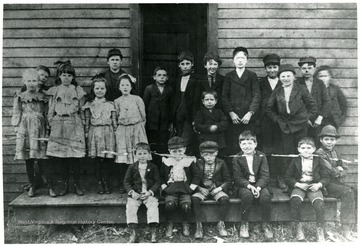 Class Photo South Alderson, W. Va.
Class Photo South Alderson, W. Va.
10. Interior View of a Typical Room at Alleghany Collegiate Institute, Alderson, W. Va. 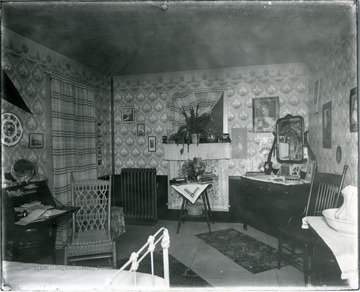 Interior View of a Typical Room at Alleghany Collegiate Institute, Alderson, W. Va.
11. 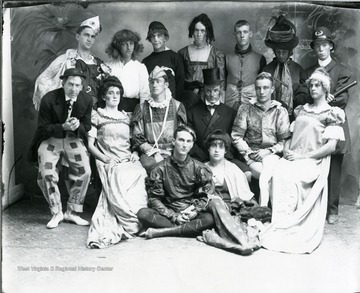 Alleghany Collegiate Institute Thespians, Alderson, W. Va.
Alleghany Collegiate Institute Thespians, Alderson, W. Va.
Group portrait of students dressed in costume. 12. Haying Scene, Helvetia, W. Va.
Haying Scene, Helvetia, W. Va.
Henrietta and Ernest Hofer and others working in the field. 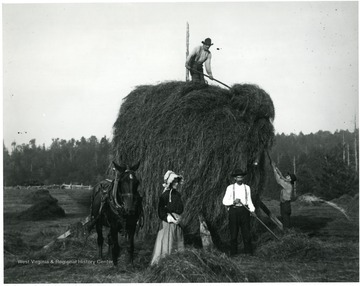 A horse is standing beside the pile. Helvetia, W. Va.